AS9100 was developed and released by the Society of Automotive Engineers and the European Association of Aerospace Industries. It is a collection of sections built upon the ISO 9001 certification clauses. These sections place even higher standards on system processes, documentation, on-time delivery, and risk assessment. 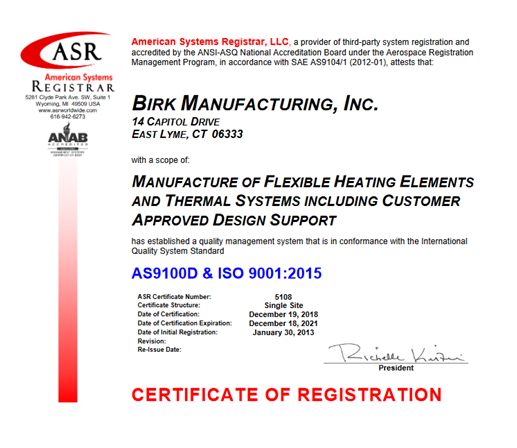 Birk’s QMS demonstrates the company’s ability to continually meet the AS 9100 International Standards. Consistent high-quality production and lean processes are encoded in Birk’s DNA, ensuring that we always meet the statutory and regulatory requirements applicable to our customers. These processes are what provide the assurance of conformity, standardization, and quality for all national and international customers and ensure their satisfaction.